We love rv’ing for lots of different reasons. We get to see the country, we get to visit old friends and make new ones and we also get to stay in different parks on these travels. We have stayed in so many that I couldn’t possibly remember every one of them but there are some that just would not be forgotten. 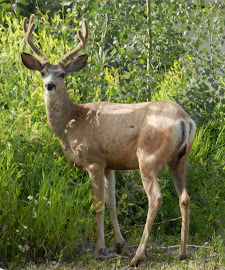 There is one RV park that we have stayed in for extended visits that is likely one of the nicest parks you will find. 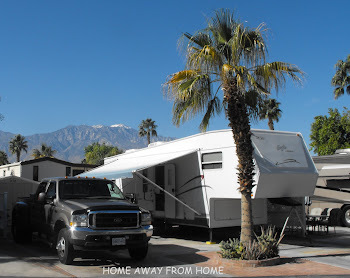 It is Desert Shadows RV park in the heart of Cathedral City, CA. which is an adult park for those over 55 years. Although we have stayed in several others in this area, this is our favorite park. The amenities in the park are wonderful and open to all those in here, renters or owners. There are two large clubhouses in the park that host socials of all kinds and three satellites that can be used for smaller private gatherings. There are six swimming pools, spas or hot tubs as we call them, a fitness center, billiard room, dance studio, craft room, tennis courts; I think you get the idea, the list goes on and on. Linda G's little hummingbird stops by often for some food. He's been such a regular visitor that he earned himself a gift so received a swing for his Christmas present and loves to use it when he stops by. He has several hummingbird relatives in the park but he is very possessive of his swing. The view of the mountains is spectacular. There are a zillion hiking trails in the area and the Palm Springs Tram is a must-see, and that is on our list of things to do. The location is very convenient for the whole Coachella Valley. Shopping is endless, no matter what your needs may be; lots of golf courses for all, whether beginners or better; the entertainment is top notch in the several casinos in the area. It is all here in the Coachella Valley. There are live as well as cinema theaters close by including an Imax. The Forest Lawn Cemetery is right down the street from the park and they ring chapel bells daily. They also have some famous residents in their ‘park’, Frank Sinatra and Sonny Bono. We may all have preferences in our search for the right RV park and where it is located is a major part of that, but we think we have found the perfect one ! To see other reasons why this is so great, click here and learn more about Palm Springs, too.